← Is Bamako back to normal? On Tuesday we started hearing about the arrests. Former prime minister and presidential candidate Modibo Sidibé was taken from his home Monday night by soldiers and brought to the military base in Kati, where the CNRDRE junta is headquartered. This was not a huge surprise, since Sidibé had already been detained by the junta twice in the last few weeks. Closely associated with deposed president Amadou Toumani Touré, he is seen by many as the incarnation of everything that was wrong with the Malian state under ATT’s rule. Around the same time, the junta arrested several more of ATT’s top officials, including at least three generals. General Hamidou Sissoko, ATT’s ex-chief of staff, and General Sadio Gassama, his former security minister and defense minister, were both nabbed at their homes Monday evening, as was General Mahamadou Djagouraga, former director of Mali’s national police. An unnamed general of the Gendarmerie Nationale was reportedly also picked up. ATT’s former adviser Bani Kanté, who also oversaw Libyan investments in Mali, was another high-profile figure whose arrest became known on Tuesday. Two more, according to local sources, are Babaly Ba, director of the Banque Malienne de Solidarité, and Adama Sangaré, mayor of Bamako. Most significant, however, was the arrest of Soumaila Cissé, who frequently served in governments during both terms of President Alpha Oumar Konaré (1992-2002) and who lost the second round of Mali’s presidential election to ATT. Unlike the others arrested (with the possible exception of Babaly Ba), Cissé has no direct links to the ATT regime. He spent most of the last decade in Burkina Faso, where he chaired the body that oversees the region’s common currency. Cissé was initially reported to have escaped arrest, having fled his home in Badalabougou, but was later picked up nearby by police and transported to Kati in an ambulance. There are indications he was injured either during his initial escape or during the subsequent arrest. Les Echos reports that he had head wounds; L’Essor reports that even the intervention of the ambassador of Burkina Faso could not dissuade the police from arresting Cissé. Why is the junta going after Cissé? I can’t say, but they’ve been targeting him for some time; let’s recall that armed men ransacked his home on the very first night of the coup. So far, it’s not clear why any of these individuals have been arrested. No announcements have yet been made by the CNRDRE. Interim President Dioncounda Traoré, for his part, seems not to have been informed of the arrests in advance. 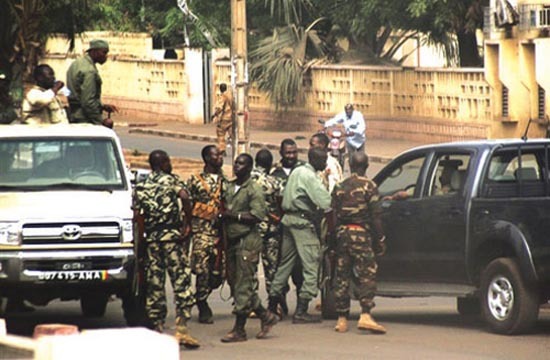 Never mind that the Malian military has no legal authority to arrest civilians. Amid all the confusion, one thing has become perfectly clear: reports of the junta’s demise were greatly exaggerated. Captain Amadou Sanogo, having had a taste of power, is not about to let it go, and has stated as much to the Malian media (though, tellingly, not to the international media). Sanogo is seeing how far he can push things, and unless political actors with legitimate constitutional mandates start to push back, he will succeed in sidelining the civilian authorities who have been ostensibly put in charge. The question now is whether such political actors can command enough loyalty within the security forces to confront the junta head-on. President Traoré and his newly named prime minister, Cheikh Modibo Diarra, are being put to the test. Update for 8:00 a.m. GMT, Thursday, April 19: More arrests were revealed Wednesday, for a total of 22 persons in custody so far, half of them civilians, half military. Kassoum Tapo, a very senior figure in the ADEMA party, and Tieman Coulibaly, head of the UDD party were both arrested by the junta, in front of the very hotel where Dioncounda Traoré has his headquarters. Both are active in the anti-junta coalition known as the FDR. On Wednesday night, the ORTM news showed images of assault rifles it claimed were discovered in the residences of some of those arrested (without specifying which ones). The CNRDRE is claiming that a “counter-coup” was in the making — further proof, if any was needed, that the junta believes it is still very much in control. Meanwhile, Senegal’s new president Macky Sall announced in Paris that Mali’s deposed president, Amadou Toumani Touré, has taken refuge at the Senegalese embassy in Bamako. This entry was posted in Uncategorized and tagged amadou sanogo, Amadou Toumani Toure, bamako, mali, politics. Bookmark the permalink. Is it political opponents to D. Traore who are being arrested? 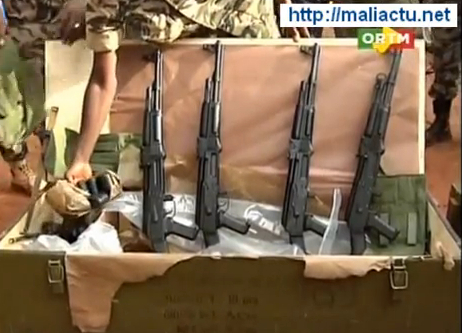 Hard to believe Sanogo basically only agreed to elections to have the ECOWAS sanctions and threat of force lifted. He seems to have got a full and complete amnesty in return, not even a promise to stay out of politics. How do you see it, Bruce? It’s not just Dioncounda’s opponents getting swept up–someone from his own party (Kassoum Tapo) was picked up yesterday. I think Sanogo has been showing a lot more cunning than most of us initially gave him credit for. He consistently expresses his support for a return to constitutional rule, while doing everything he can to hold on to power in complete violation of Mali’s constitution. He is following his own radical interpretation of the “accord cadre” signed with ECOWAS earlier this month, one that abides by the extremely vague letter of the agreement but defies its spirit. He thanks the international community for its support and concern, yet tries to stymie the ECOWAS agenda at every step. While ECOWAS, and especially the Burkinabè, deserve props for negotiating the “accord cadre,” it’s obvious now that they only succeeded in doing so by bracketing the tougher questions–like the role of the CNRDRE during the transition–thereby kicking the can down the road. Meanwhile the junta is pursuing business as usual under Dioncounda, whom it considers a temporary, figurehead president, and it’s even possible they’ll go after him once his 40 days are up. Keep it coming, Bamako Bruce! We love your insights! thank you from all of us were evacuated and are itching to return! it’s much more satisfying/informative to read this than to rely on the western media, who seem to have forgotten what happened already! keep it up. Thank you for all your writings. Extremely uselful and concise!! !